You can add a title by calling set_title() method. It will be displayed on the top of the chart. Notice that the parameter is an array. For demo purpose, The HTML code is excluded from the source. The render animation is now supported for the most renderer types. By default, animate is turned off. Simply call set_animate() method and pass true as the parameter value to enable animation. You can set some default options for differnt parts of chart for convenience such as series default, axes default, legend default etc, with a single function called set_defaults(). This is a great helper functions to set all the default values in one place. set_defaults() is a great helper function with simple default values. However, if your graphics have a lot more complicated default settings, you should use each set default methods individually for code readability. For example, to set series default, you can use set_series_default() function. Series default are the default options that will be applied to all series such as type of renderer, renderer options, label, color, shadow etc. We will now start diving deeper into the phpChart. We will go over some of the main functions used for specifying properties in different phpChart object. For detailed technical instructions, please take a look at the documentation section of the web page. Let’s start out an example with the grid object, which is object representing the grid on which the plot is drawn. Use set_axes() method to set axes properites. You can have 2 x xaxes, and update to 9 yaxes. You can also set individual x, y axes properties. To set only x axes properties, use set_xaxes() method. Likewise, to set only y axes properties, use set_yaxes(). Set the properties of legend object using set_legend() method. EnhancedLegendRenderer is a useful renderer plugin for legend. Click on one of the legends to hide or unhide a particular series. In addition, the second example also demonstrates using a data source from a URL using Ajax for plotting series on a PHP graph. In the example it passes URL jsondata.txt as the data source, which can be replaced with any URL provisioning data in valid JSON format. Documentation on set_data_renderer() method used in the examle can be found here. You can label specific data points in a graph with additional text or even image to further describe the data presented in PHP chart. To do that, the non-renderer plugin, “pointLabels”, is required. This plugin places labels on the plot at the data point locations. The last value in the data point array in a data series is used for the label by default. The following example uses HTML image for data points. Bubble chart is a little different from pie and bar charts because it represents three dimensional data. Data is passed in to a bubble chart as a series of [x, y, radius, ]. The optional fourth element of the data point can either be either a label string or an object having ‘label’ and/or ‘color’ properties to assign to the bubble. The bubble chart requires plugin::BubbleRenderer. OHLC, HLC and Candlestick charts all requires plugin::OHLCRenderer renderer plugin, then simply set the candleStick property to true in rendererOptions. In phpChart constructor, pass the external data source as the first parameter as either a file or URL. In this example, it points to jsondata.txt which is external text file on the same server. But it also can be a URL to an external site. It’s common to have series that pairs data value with arbitrary text. The key is pair both data value and text in array in the following format and include three plugins: canvasTextRenderer, CategoryAxisRenderer, and CategoryAxisRenderer. You can also render chart with dots or points only without line in between by setting “showGridLine” to false. You can further remove the grid and borders using set_grid() method. 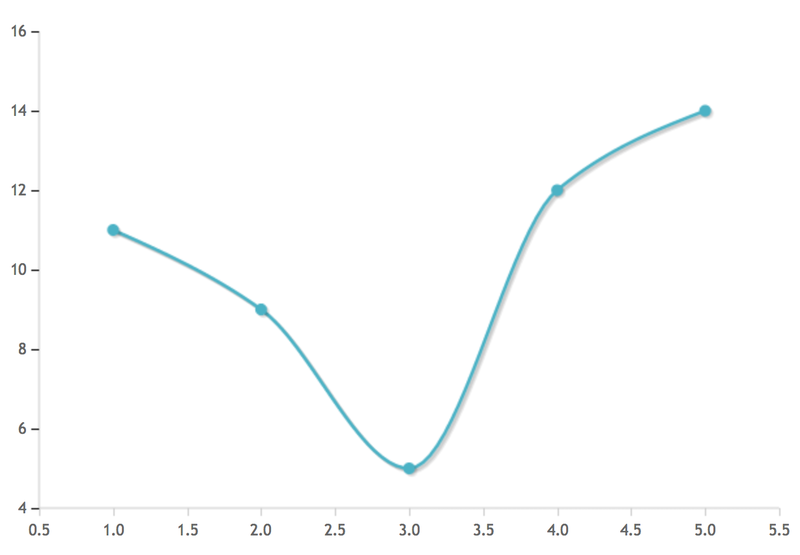 Add plugin “trendline” to show the linear approximation. // remove background, border and grid. Curved line can be easily achieved with rendererOptions “smooth” property. When it is set to true, it will display a smooth curved line between each points instead of straight lines. Display logarithmic axis using LogAxisRenderer. Make sure the tickDistribution is set to “power” for power of 10 display on its axis.